Acquired directly from the above by the present owner in July 1987. New York, Solomon R. Guggenheim Museum, Chillida, 1980, no. 284 (illustrated p. 146). Pittsburgh, Carnegie Institute, Chillida, October 1979-January 1980, no. 284 (illustrated). Hannover, Kestner-Gesellschaft Hannover, Eduardo Chillida, April-May 1981, no. 26 (illustrated in colour p. 79, and in black and white p. 80). Zurich, Galerie Maeght, Chillida, June-July 1981, no. 14. München, Galerie Thomas, Chillida, March-June 1985, p. 21 (illustrated). Madrid, Museo Nacional Centro de Arte Reina Sofia, Chillida 1948-1998, December 1998-March 1999, no. 38 (illustrated in colour p. 162). Hommage à Goethe IV is the fourth work in a series of five alabaster sculptures dedicated to Johann Wolgang von Goethe. In this outstanding example from the series, Chillida explores the notion of metamorphosis; one of the key concepts outlined in Goethe's writings on Natural Science. "The most beautiful metamorphosis of the inorganic kingdom is when, in the process of formation the amorphous is transformed into the created. To this end, every mass has the driving face, and the right" (J. W. Goethe, Naturwissenschaftliche Schriften, vol 1, p. 634). Taking Goethe's ideas as his starting point, Chillida attempts in this sculpture to interact with the stone and through the sculptural process to reveal only the inherent nature of what is already there. To let the stone become what it has always been. Towards this end, Chillida has left the raw unworked form of the stone more or less unaltered. 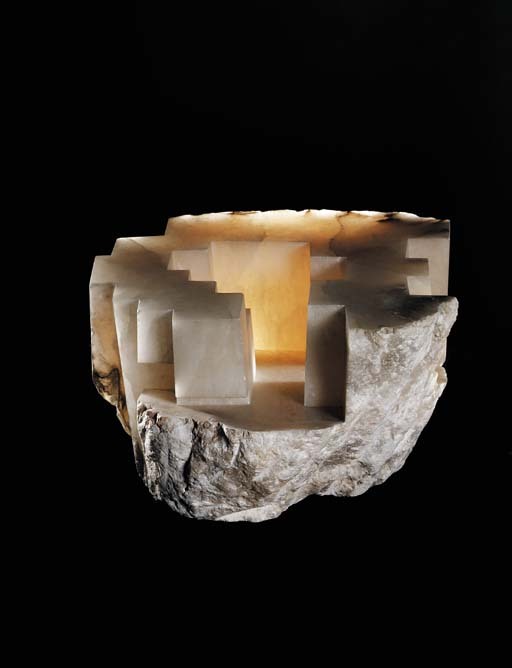 Cutting flatly at only a few points, he has worked a chamber into the alabaster which outwardly is blocked but within which are several open rectangular passages that establish a strong and paradoxical play between open and enclosed space at the very heart of the work. This strongly architectonic structure is penetrated by light which the translucent nature of the alabaster transforms into a quality reminiscent of the "black light" of Chillida's hometown on the Atlantic coast of Spain. The immaterial nature of this light has been used by Chillida as sculptural material and adds a further dimension to the sculpture in the way that it is paradoxically used to define and articulate the space both inside and outside the sculpture. Stressing the coexistence of volume and weightlessness and of the immaterial with the material it also emphasises the metamorphosis of infinite space into an internalised and personal space.